Throckmorton’s new production of “Romeo & Juliet” takes the show from a Proscenium production to the streets of Verona and beyond. The actors used their Mill Valley streets as the meeting place for their first act in this unique drama. All rooms in the Throckmorton are linked in a scavenger hunt that searches out the beauty of this play. Illuminating the outside theatre wall with color provides the backdrop for the families of Capulet and Montague, as they act out their family feuds with skirmishes and verbal insults for the surprised audience. Escalus, the Prince of Verona (played by Jean-Paul LaRosee), finally intervenes from a second story window to quell the confusion below. In a lighter scene, Mercutio (played by Max Kligman) and Benvolio (played by Brage Rollmann) cajole Romeo (played by Andre Amarotico) into coming to the costume ball inside to check out the beautiful belles of the times. Romeo, as a Montague, takes up the challenge to attend the Capulet costume ball. From this edge, the story evolves into one of our greatest love stories. The audience returns to the theatre and joins the good Lord Capulet (played by Michael Nurge) and Lady Capulet (played by Tina Rutsch) at the ball. 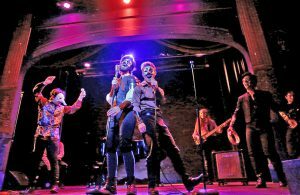 With the provided masks, we enter the theatre ballroom, painted for the 16th century, with music provided by the band onstage with Max Kligman (as Mercutio) and Joshua Martinez (as Gregory). All the cast join the audience in period dances and costumes. Of course it is here that Romeo joins the party and discovers his fair Juliet (played by Gillian Eichenberger). After a small altercation with Romeo, the ball ends and the audience is ushered back to their seats. 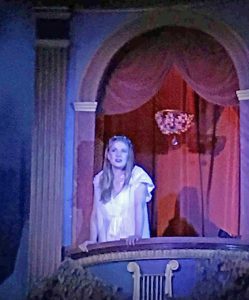 Juliet peers out from her balcony overlooking the audience and pines for the Romeo she met at the ball. Romeo, hiding below, comes out to acknowledge his love for the woman of his dreams. Eichenberger and Amarotico play with the romantic language of the age in a most delightful way. We see the tenderness in their longing and the reach to express their youthful hearts’ desires. From this balcony scene, the audience is divided up into three smaller groups to allow the people to move easily through subsequent scenes in the building room-sets. The staging is amazing as we move from one 16th century room to the next, up stairs and through mysterious doors. The three groups never meet. The actors do their scenes three times, one for each group. Tea is served along the way. Alas, this is a drama of both life and death. In the next scene, Benvolio from the house of Montague (played by Brage Rollmann), is killed in a fight in front of us. 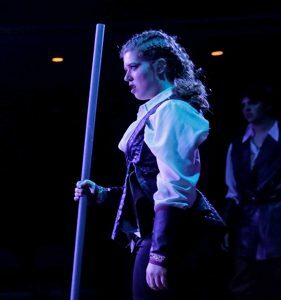 Romeo comes in to revenge the death and in turn kills Tybalt (played by Emma Campbell) from the house of Capulet. Aghast, the audience is led upstairs, out of the lower theatre and into the Capulet’s Smoking Parlor, by way of the two bodies on the floor. The news of the deadly fight has spread, and Romeo is banished from Verona. One major character in this drama is the Friar Laurence (played by Citizen GreyWolf). GreyWolf played Falstaff in Shakespeare’s “King Henry IV, part 1” and Harpagon in Moliere’s “The Miser,” both with the Curtain Theatre. He is at his best in this role as the confessor and apothecary. GreyWolf’s upstairs digs are beautifully dressed with magical panels, 16th century designs, paintings, and alchemical objects. GreyWolf plays the perfect iconoclastic host to the cabal of audience members experiencing the frantic interactions between the Friar and the outcast Romeo. Steve Coleman has implemented a magical world throughout the Throckmorton Theatre. Each room displays his unique quality as a true renaissance artist. Panels and set pieces from past productions are displayed in a perfect alignment in each room to capture the essence of each scene. 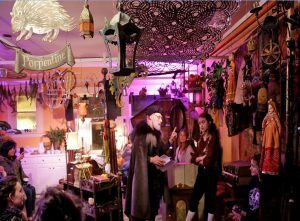 The Friar’s lair set allows the audience to watch GreyWolf and Amarotico work out the emotions of the moment amongst the whimsy and designs of an alchemical age. Juliet’s chamber reveals a feminine bedroom that frames Eichenberger’s plot to join her love. There is even a piano room painted with fantastic frescos up the walls and through the ceiling. Oh, yes, there are surprises throughout the journey, so beware. Lucy Mercer and Amy Marie Haven have done the impossible. They have taken actors and audience through a maze of doors and rooms without anyone getting lost. They kept the plot intact along with the actors’ energies and emotions through the experience. Congratulations. This is an innovative way of presenting Shakespeare to an audience and it is a winner. Andrea Schwartz’ lighting is always magical. How the lights follow the scene in Juliet’s chamber is unknown, but it works. 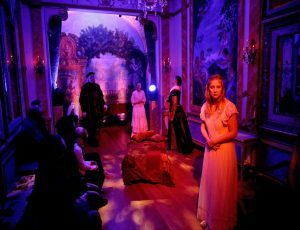 “Romeo and Juliet,” by William Shakespeare is produced by Throckmorton Theatre. Director: Amy Marie Haven. Artistic Director: Lucy Mercer. Scenic Designer: Steve Coleman. Costume Designer: Amie Schow. Sound Designer: Edwin DeShazo. Lighting Designer: Andrea Schwartz. Fight Choreographer: Zoe Swenson-Graham. Max Kligman: Mercutio. Alex Munoz: Paris. Jean-Paul LaRosee: Prince. Citizen GreyWolf: Friar Lawrence. Gillian Eichenberger: Juliet. Michael Nurge: Lord Capulet. Tina Rutsch: Lady Capulet. Joshua Martinez: Gregory. Catherine Hackett: Nurse. Emma Campbell: Tybalt. Hannah Canin: Young Capulet. Alexander Shayeb: Sampson. Andre Amarotico**: Romeo. Brage Rollmann: Benvolio. Louisa Conte: Emilia. Eva Rowbury: Baltasar. Alex Munoz: Abraham.